Niedleich High Hopes, (Frankie)has just 'arrived' on the show scene, and will be handled by his co-owner Edwina Hoffmann-Madsen. A son of BISS Au.Ch.Niedeich Frazr atPenlan, Frankie is definately "his fathers son". A cobby male with a great coat coming through, true on the move, excellent topline, good earset,and a super personality. 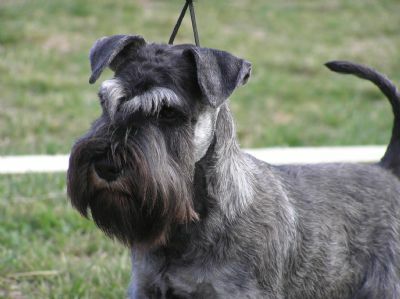 Niedleich Mini Schnauzers look forward to the 'show career' of this special puppy. UPDATE: Frankie & Edwina had a great win under breed specialist Mr. Keith Brown (NZ) on 26th June 2010. Taking out Baby Puppy of Breed and BABY PUPPY IN GROUP. WELL DONE!!! Frankie has just won BEST IN SHOW, at the SCOV Open Show, on 2nd Nov 2010, Judge Mrs. Fionna Paton (Vic). 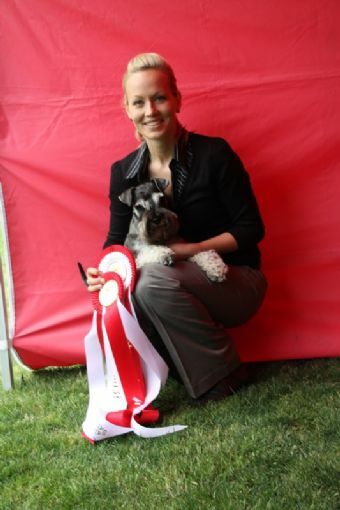 Update, Frankie won JUNIOR IN SHOW at the SCOV Speciality 20th March 2011, Judge Mrs. Lyn Watson. 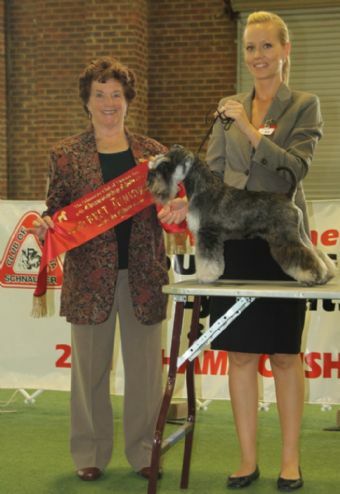 Schnauzer Club of S.A. INTERMEDIATE IN SHOW 2011,awarded to Frankie by Judge Mrs. G. Ogburn UK. Frankie is now an Australian Champion, gained at Kyabram A H & P under Mrs. B. Watt. (Vic) CONGRATULATIONS!!! !